This line is used for stranding of loose tube elements less than Φ5mm. The line has following characteristics: The line speed is very high, constructional speed can reach 80m/min. Process speed is 60m/min (as binder pitch 25mm). Multi-stranding disks SZ oscillator unit with torsion accumulator, turning rapidly with low noise, lesser linear groove. Positive and negative concentric binder with patent technology, binder max. revolution is 3000rpm. Driven strength member pay-off with constant tension. Loose tube pay-off with accumulation, tension of pay-off is stable, it is suitable for high speed SZ cabling requirements. 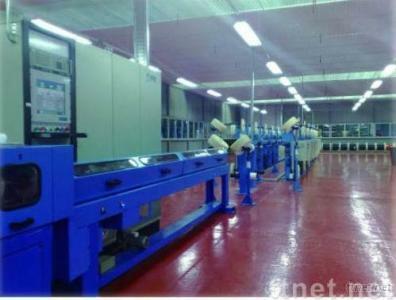 Driven tape pay-off with long length tape, thus reduce tape change time, improve producing efficiency.